Hi-ya! 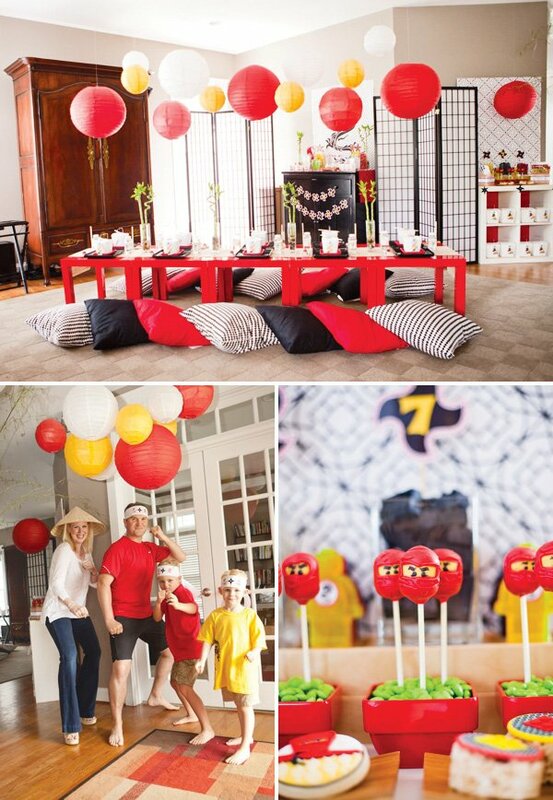 HWTM Contributor, Maureen Anders of Anders Ruff here – excited to share my son’s recent Modern Ninjago Style Party (with lots of creative ninja birthday party ideas)! 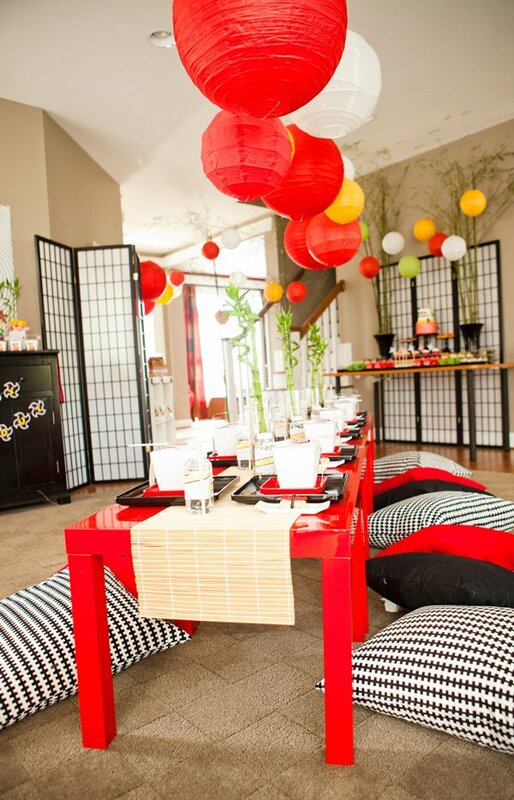 Bamboo, lanterns and red lacquer tables for floor seating gave the party an Asian influence. 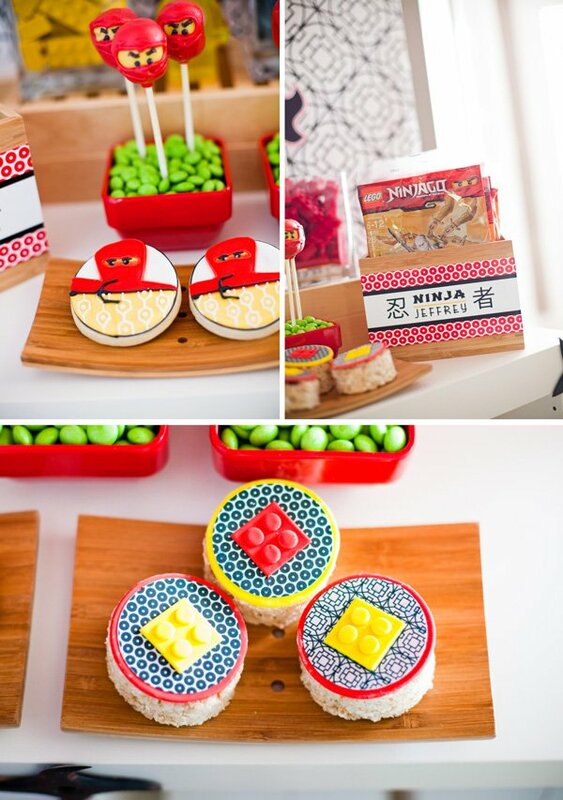 Creative desserts such as candy sushi, “edamame” jelly beans and Ninjago themed treats set the tone for a kid-friendly Ninja party. My son loves Lego Ninjago (as do most 7 year olds!) 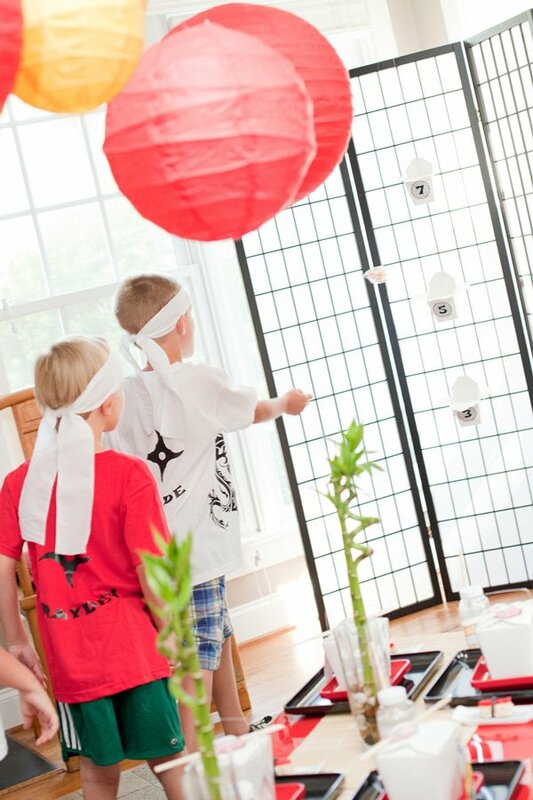 so we went with a Ninja style party and created an Asian environment by pulling in traditional elements. 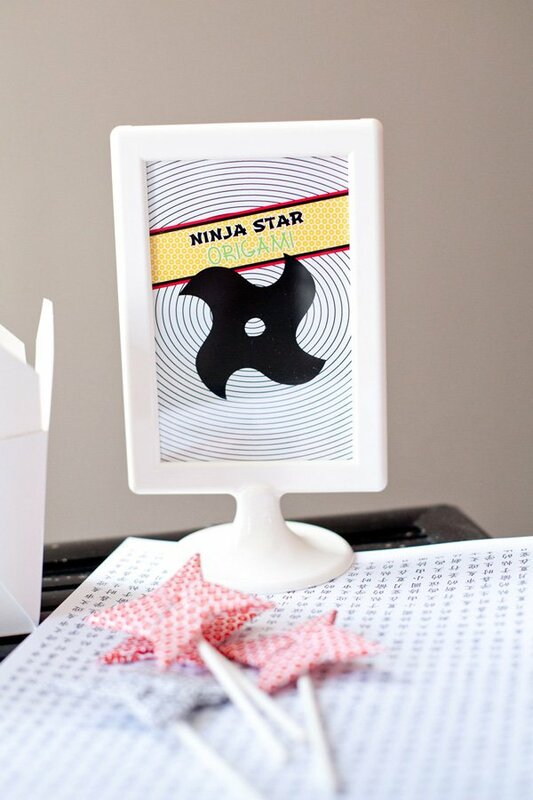 I designed a brand new ninja invitation and ninja complete printable package for our shop and used all of the printables throughout the party. I bought real bamboo shoots with the leaves on and adorned the entrance and dessert table. 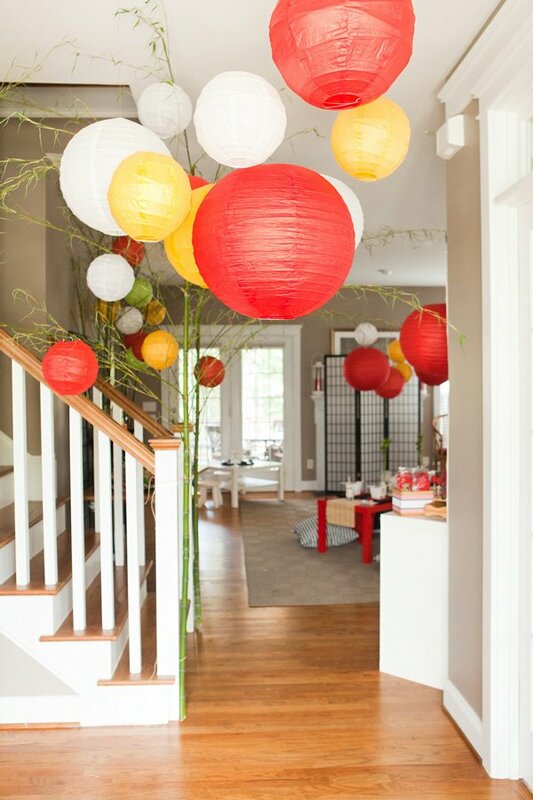 Paper lanterns (from Paper Lantern Store) of all different sizes were hung over the entrance as well as over the seating area. Inspired by our clients in Dubai, Me&Riley, and their floor seating ideas, we set up a long table using Ikea Red Lacquer tables. I added a DIY bamboo runner down the table. (I got $1 store bamboo place mats and connected them together with some white thread). Lucky Bamboo shoots were displayed in the center along the table in vases with rocks. 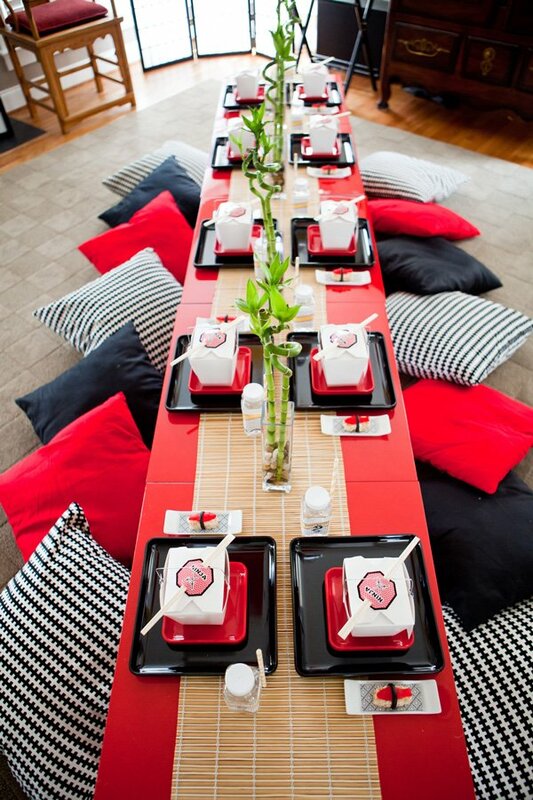 Each place setting had a black lacquer plate, red small plate and a Chinese take out container with their lunch inside. 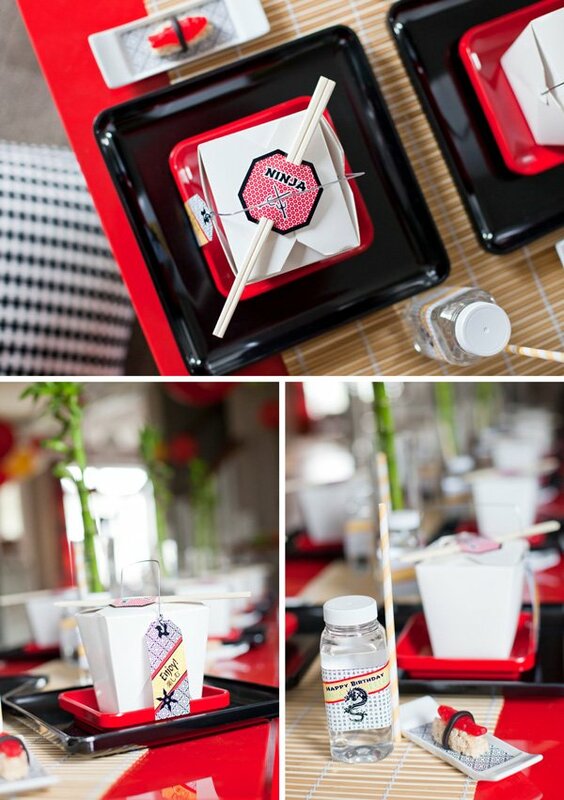 Chopsticks were labeled with our printable and placed on top. An “enjoy” hang tag printable adorned the Chinese take-out boxes. 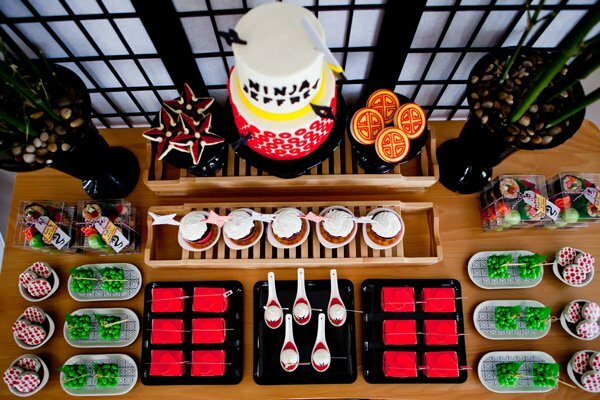 A small ceramic white dish was beside the plates and it held a single piece of candy sushi on a patterned paper lining. Beverages were displayed in plastic bottles (from I’m With Cupcake) and adorned with a printable drink wrap and paper straw. Ikea pillows were placed on the floor for the children to kneel on as they ate. Rice Paper traditional Chinese room dividing screens were placed around the room. 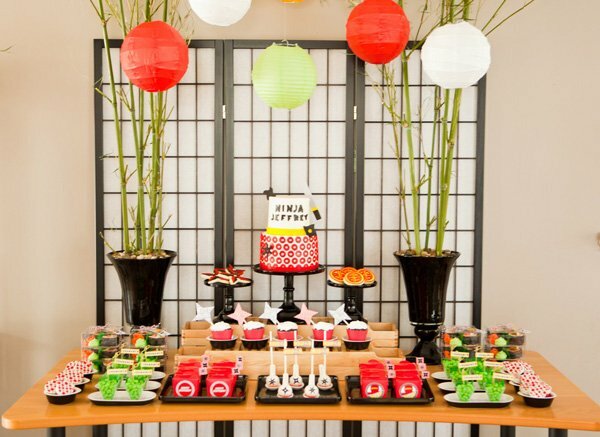 A Chinese screen was used as the backdrop for our dessert table. Bamboo elements were carried in again by sticking shoots out of large black vases. Rocks filled the vases to keep the bamboo in place. Paper lanterns were hung from the ceiling. 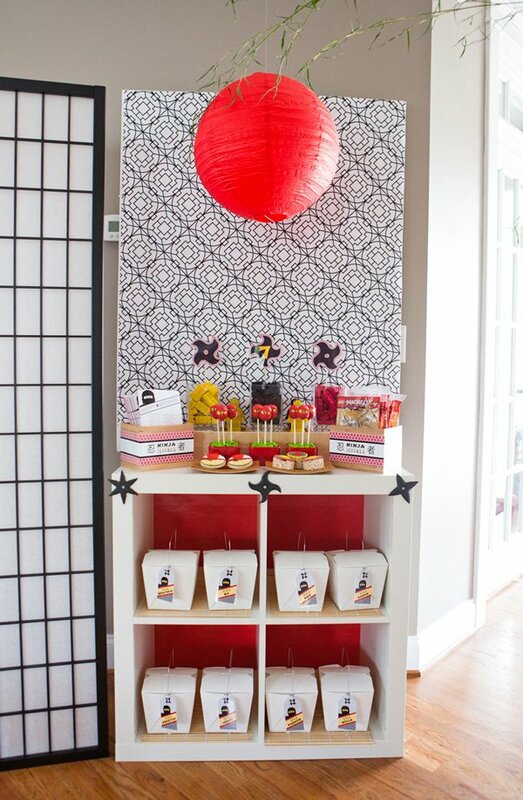 The second tier held ceramic black/white vessels from Ikea and cupcakes with origami DIY ninja star toppers that we made out of our printable patterned papers. They were wrapped with cupcake wrappers from Bella Cupcake Couture. 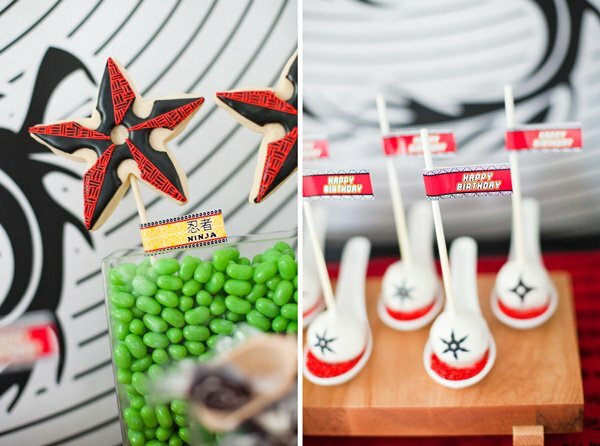 The bottom level had Chinese tasting spoons with red sprinkles and a ninja star cake pop from Pop A Razzi. Red Chinese take-out containers were filled with rice cracker mix from Oh!Nuts and labeled with our printables. 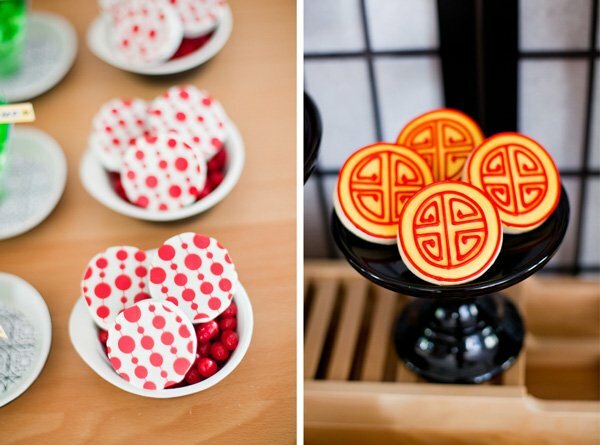 Vessels were filled with cookies that had an adorable red/white dot/line pattern (reminded me of lanterns) from Sweeties by Kim. 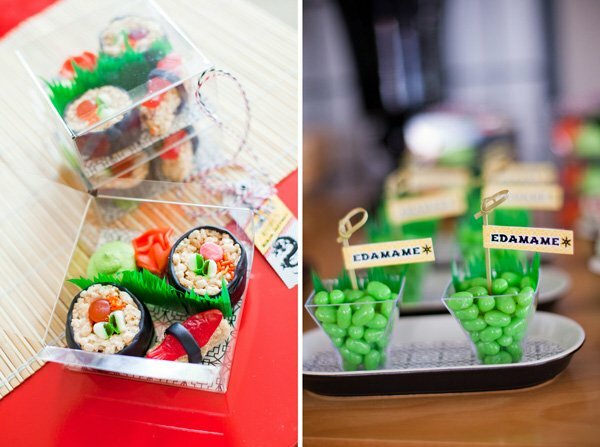 We lined trays with our patterned papers and put green jelly beans (edamame) in clear fun shot glasses with some green sushi grass and labeled them with a printable “edamame” flag. I made candy sushi and packaged it in an adorable clear candy container from Nashville Wraps. I lined the bottom with our printable patterned paper underneath the container to add interest. I used rice krispies, marshmallows, Swedish fish, gummy green/white rings (to resemble cucumber), starburst and airheads (to resemble the fish) and orange sprinkles (to resemble roe). I made green meringues that represented the wasabi and used peach tinted fondant for the ginger. I separated the sides with some green sushi grass (like you see in real sushi take-out containers!). We tied them up cute with twine (The Twinery) and a printable favor tag. Our printable dragon poster was used as the backdrop (only $5 to print!) for our Candy Take-Out. 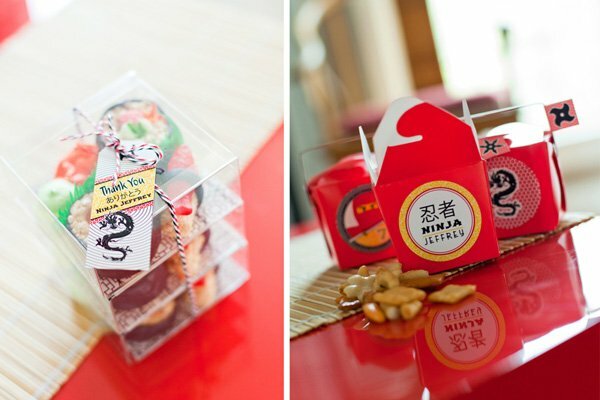 The idea here was to have the children fill their little chinese take-out containers with candy. A red Asian runner from A to Zebra Celebrations was used on the black lacquer furniture. We filled vertical rectangular vessels with various candies (Oh!Nuts). Cookies from Whip It Good Cookies were adorned with printable party flags and stuck out of the vessels. Also, homemade lollipops from This Charming Candy were flagged and stuck out of the vessels. 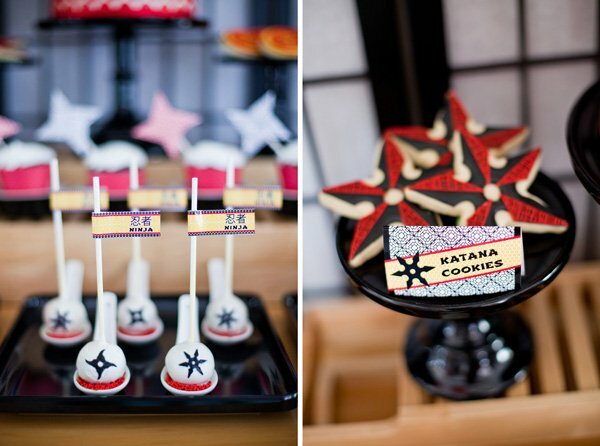 Cake pops from Pop A Razzi were flagged and placed on white ceramic tasting spoons and placed on a wooden sushi board. We adorned the front of the buffet with a Ninja Star shaped printable banner. (Available in our shop). It read “Candy Take-Out” and the boys loved it! 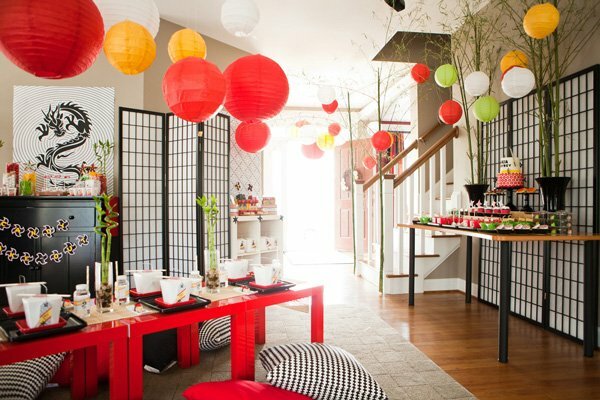 A printable patterned poster was used for the backdrop and a red lantern was hung over top the favor table. We used a bookshelf that we lined with red wrapping paper for the table. Large Chinese take-out containers (Nashville Wraps) were tagged with our printable laminated favor hang tag (the kids can use these later for luggage tags/school bag tags!). 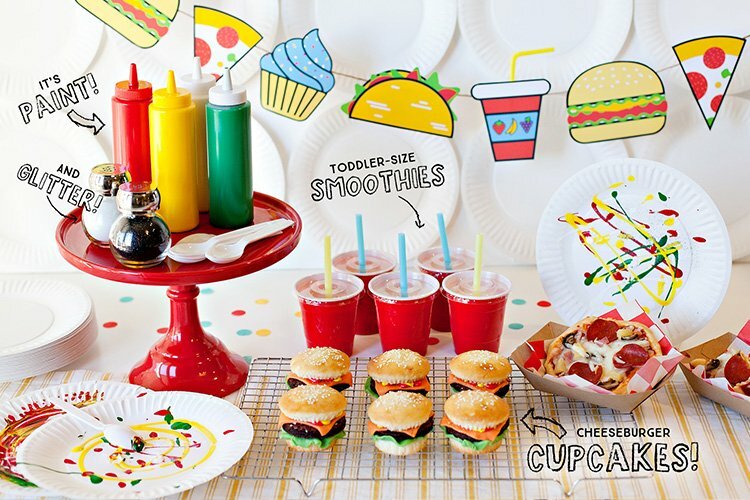 The children would use these at the end of the party to get their favors. 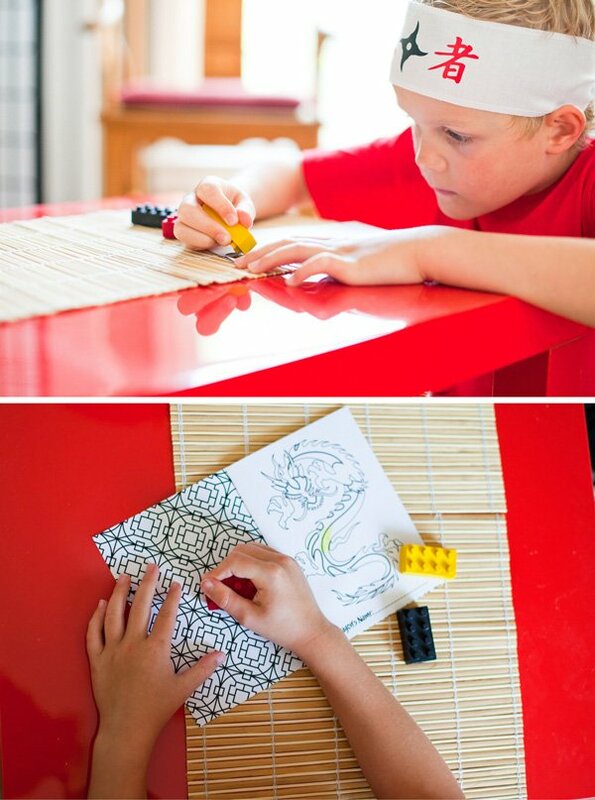 Printable Ninjago Coloring books were “bound” with twine and the kids could take the coloring book and some lego shaped crayons (from Posh Paper Creations). The coloring books were displayed in bamboo boxes from Ikea. The other side had a bamboo box with small Lego Ninjago sets that the children could take home. They also got a lego man shaped soap (from Favors by Angelique) Cake pops from Pop A Razzi were placed in the red lacquer bowls. Sugar cookies were displayed on bamboo soap dishes as well as circular rice krispie treats. The rice krispie treats were topped with adorable fondant toppers that Two Sugar Babies made using our custom printables and their fondant Lego brick shape. 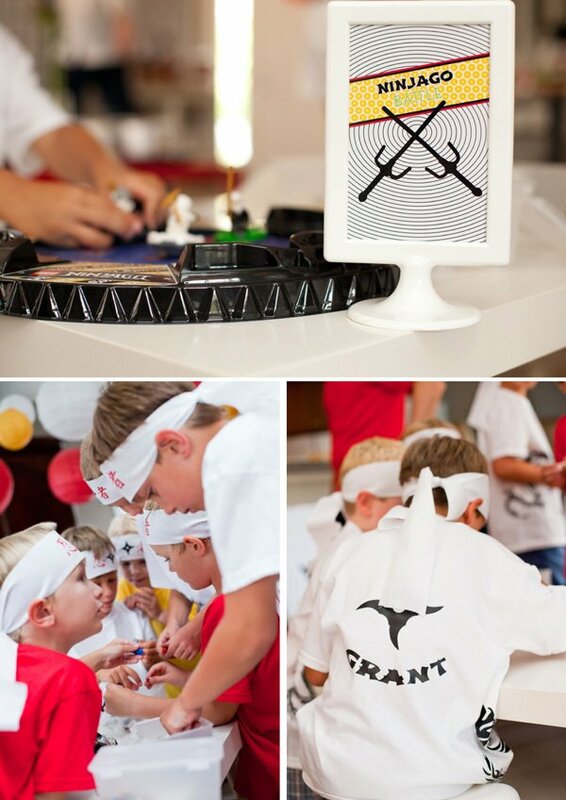 When the kids arrived, they received a personalized dragon shirt with their name and a ninja star on the backside and a ninja headband (from Made by Morgan). I bought some fake Chinese money at our local Asian grocery store. My kids love fake money so we decided to use this to give the kids who won the games during the party. 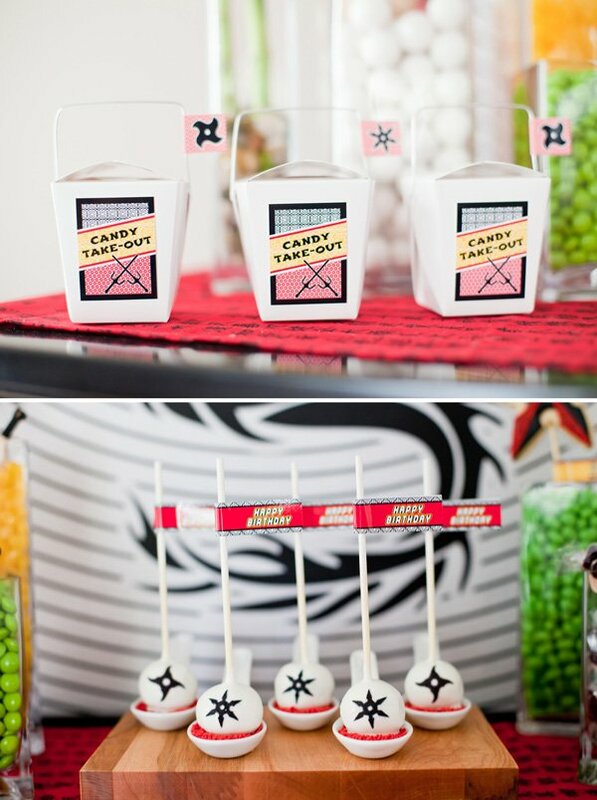 At the end of the party, they would “Buy” candy from the Candy Take-Out station and the favor table. (Really they just got to take whatever they wanted and keep the fake Asian money). The main activity was the Lego Ninjago Battle. My son, Jeffrey, has tons of Lego Ninjago spinners and weapons so we set those out and the children got to battle with each other. We bought the arena at the local Lego Store and we kept track of points for each battle. This kept them entertained for awhile! The first game was our “Fortune Cookie Toss”. 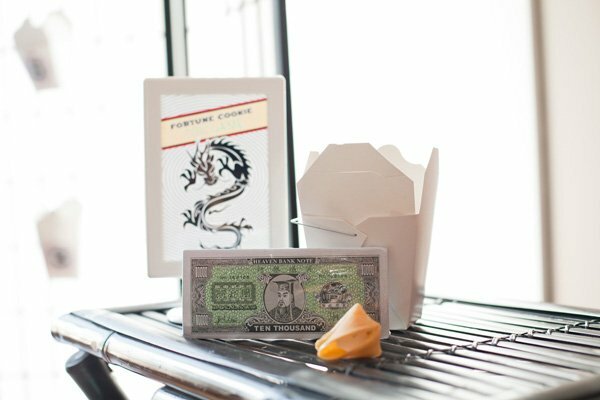 We printed 3, 5, 7 point logos and placed them on the Chinese take-out containers that we hung from the Chinese folding screen. They were left open so that the children had to try and toss the cookie into the containers. The children received points for each cookie they got in the container. The second game was a “Ninja Star Throwing” Game. I bought rubber ninja “shuriken” stars online and they are safe but do stick into styrofoam. I used a printable poster with a giant ninja star and 7 in the center. The kids got 4 stars to throw. For each one they got in the board, they got a point. If they hit the 7, they got 7 points. The boys LOVED this game! The third activity was origami star making. I printed out patterned paper from our printable ninja collection on copy paper and taught the kids how to make origami ninja stars. (These are what I hot glued to lolli sticks and stuck into the cupcakes on the dessert table). We had a custom pinata (by Partylicious) made for the party. 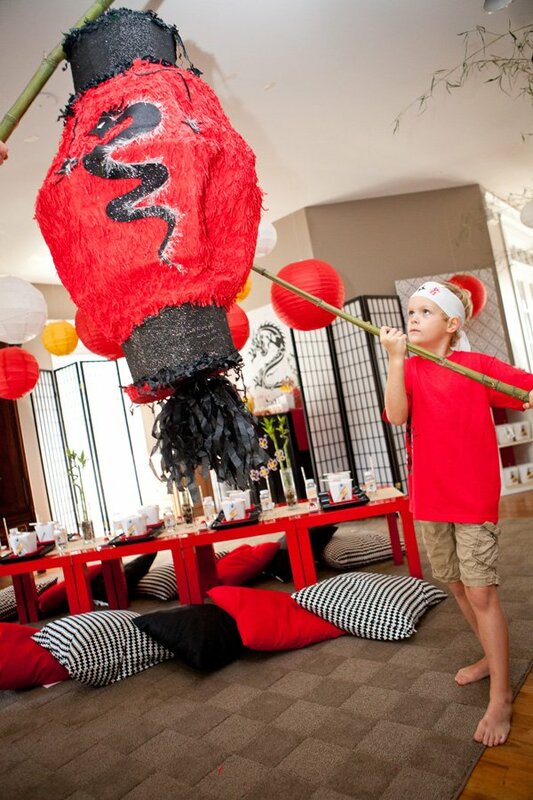 The little ninjas used bamboo sticks to take their hits at the pinata. The children had a blast and didn’t want to leave! 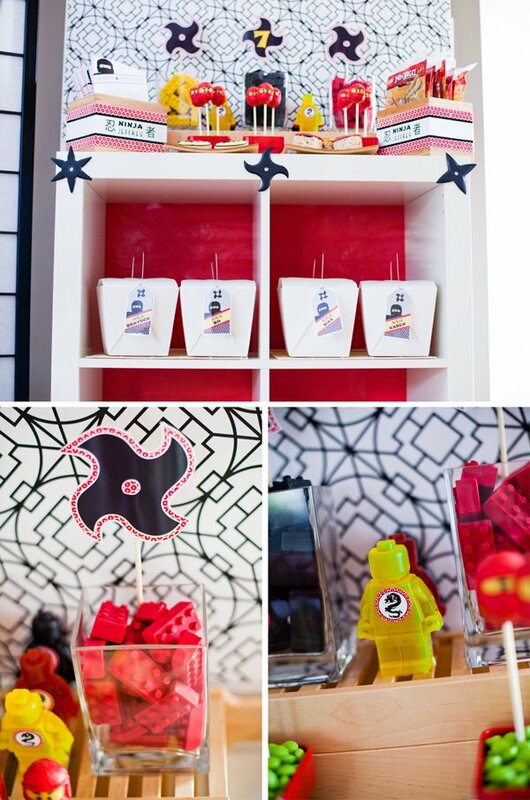 This theme is great for a regular Ninja party or a Lego Ninjago party! 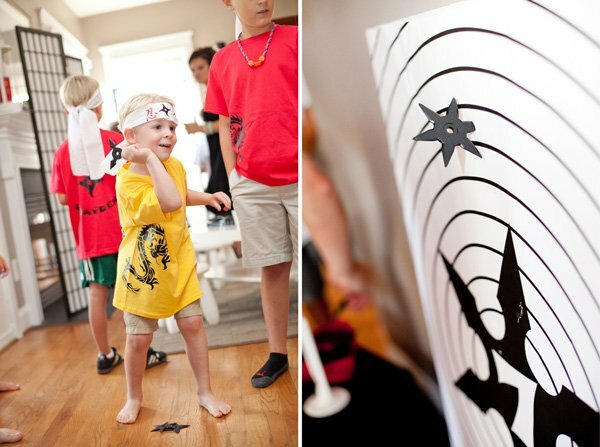 The Ninja Invitation Printable and all Coordinating Printable Ninja Designs shown in this party is available for sale in our shop. Where did you get all the rice paper room dividers? Did you make them? Hi there! We borrowed them but you can find them at Hobby Lobby, Walmart, Target online and more! ;-)Thanks! My son would love this! He is a huge Ninjago fan. Gives me something to seriously think about for his birthday coming up. Wow! You ladies are incredibly talented, Maureen! Your sons party looks wonderful. Fun theme! Question–where did you get the wood plates that your cookies and rice krispie treats are sitting on? Ikea? Also, where did you print the $5 poster? Hey Ricka! We printed the poster at a local printer that does blueprint printing. It was called Post Net. Our design is available in the shop, though! ;-) Thanks! Love it! Thank you so much for featuring my soap Favors! They look amazing! What a unique way to display them too! 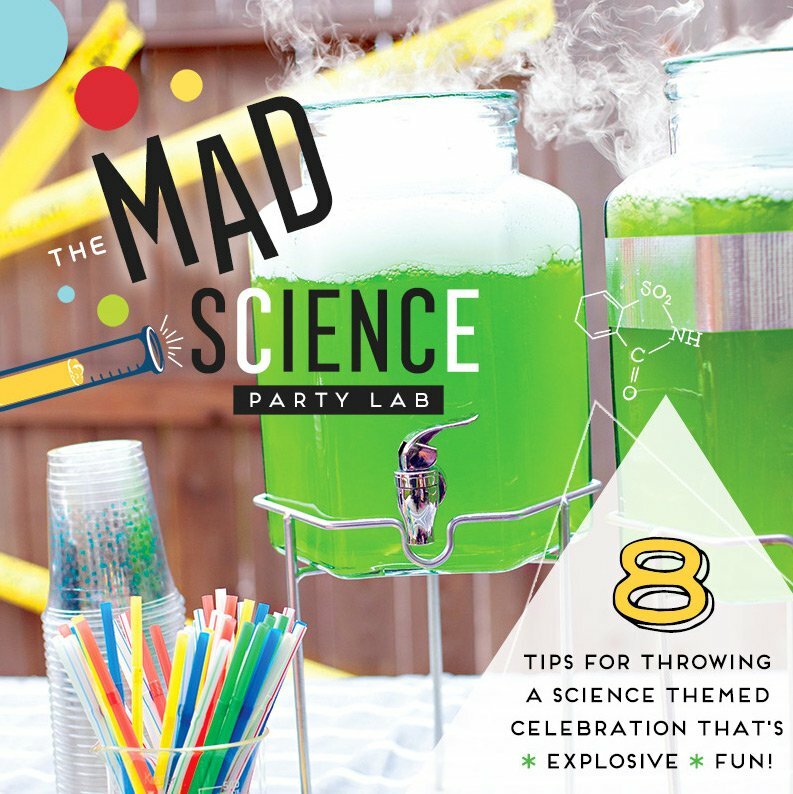 What a FANTASTIC party idea for a boy (or girl)!!!! 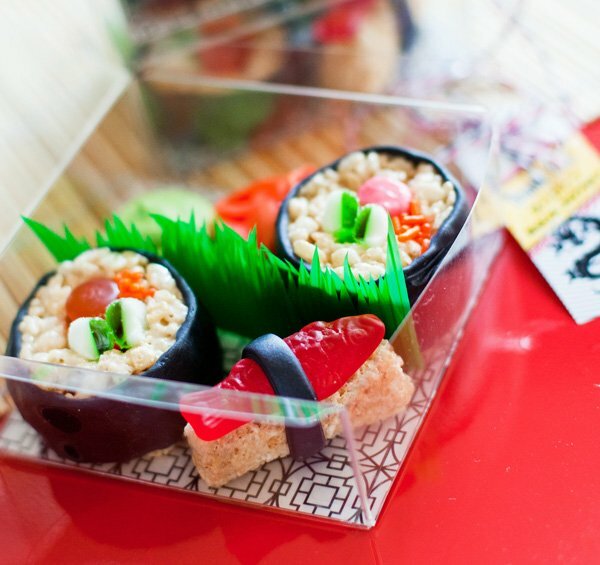 Where did you find the paper grass you inserted in the sushi containers? All of the details are amazing! I love this stuff it is so creative. you have way too much money! I am jealous. I don’t think it’s a good idea to play with those paper money. It’s meant to be burnt for the dead. A religious practice carried out by Taoist believers. 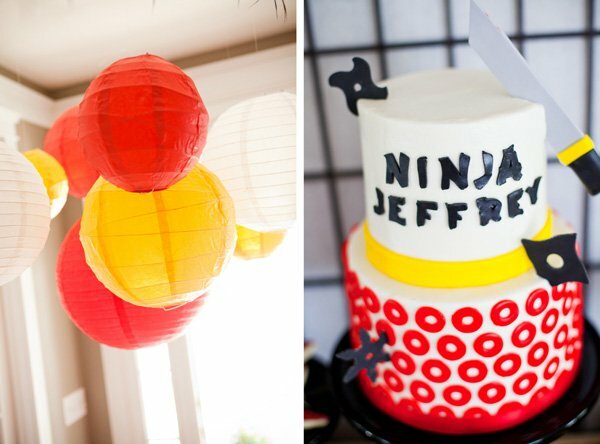 We are having a Ninjago birthday for our Jeffrey too (he will be 6). He could not believe the cake had his name! 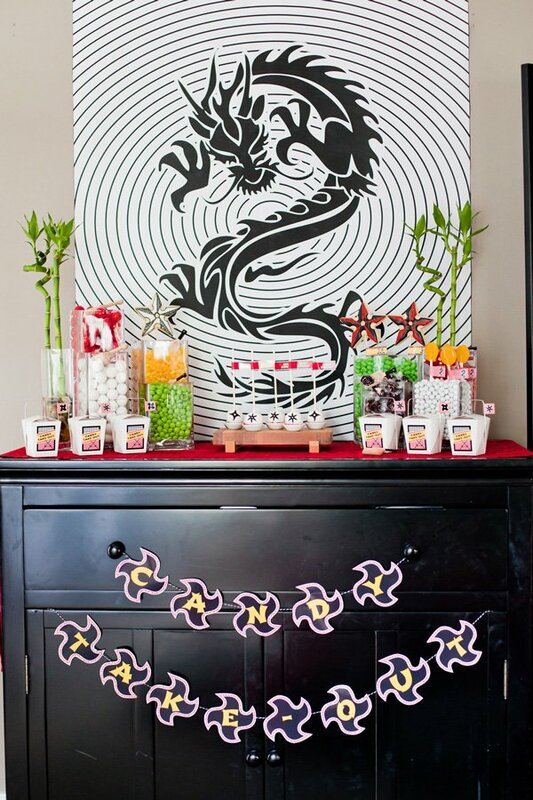 But I did the cost add up in my head and with the decor ($10.00 per lantern color, $10.00 per bamboo shoot, $6.00 each for the Ninjago favors alone (each package), the containers, the shades, the money, the games, etc. I am guessing you spent well over $600.00 for everyone. We don’t have that budget. We have Oriental Trading Company budget. I spent less than $75.00 for EVERYTHING. Here is how… I bought two bags of balloons from the dollar store. (The long ones you can make into things) I made “ninja” swords with them. Then, I got baby food jars and painted them yellow like Lego heads, and let the kids decorate them with “ninja” themed paper and glue. Then, I used an old t shirt cut into strips for the head bands (like six year olds care where the material came from, right?) I used Fray Stop on the edges because I didn’t feel like sewing two dozen edges. Next, I went to our local “restaurant supply” store and bought take-out containers, which are quite large. Panda Express was generous enough to donate chop-sticks, and bags. From Oriental Trading Co. we got Kung Fu panda tattoos, Chinese Lantern Craft kit, Mini oriental noise makers, mini bamboo fans (in red and blue), ninja rubber ducks, and red and blue napkins/ silverware. We also let the kids make their own pillows to sit on. (I used a pillow case from the dollar store cut into four and stuffed with the material left-overs I keep for just this purpose. If you aren’t into saving everything, you can also ask the local craft/fabric store for the strips left-over from cuttings. Most of them will give them to you or charge a nominal fee). 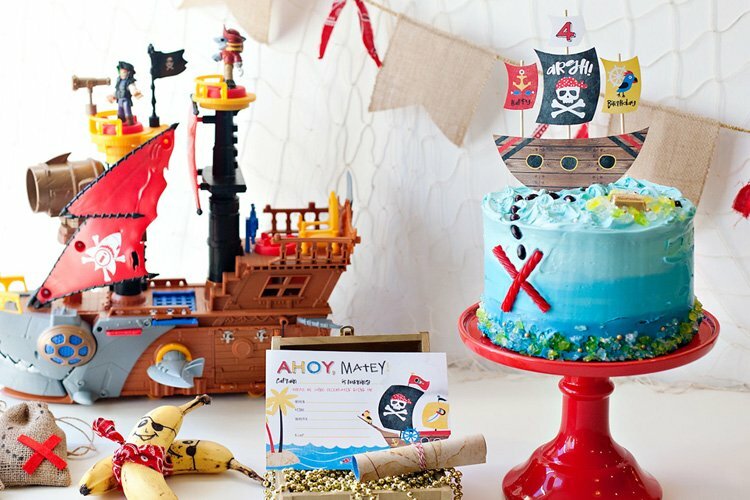 I made the cupcakes and cake https://www.pinterest.com/pin/156500155772124623/ Did our party look as fantastic as this one? Well, no, not really. Did my kid know the difference? Absolutely not. Adorable party! Thanks for blgging your ideas so the rest of us with ninja crazed boys can get ideas! I would like to know where you purchased the rubber throwing stars and where you got the large piece of styrofoam. what was in the lunch boxes? 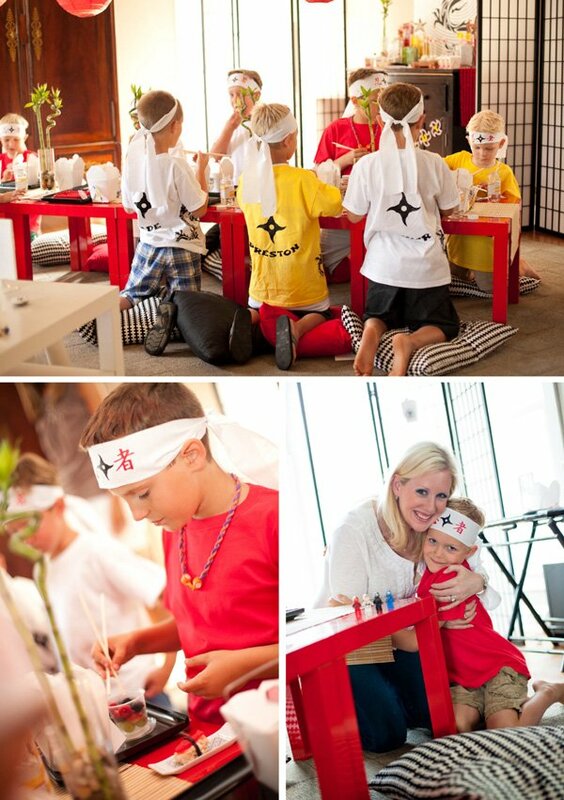 Our whole family loves Naruto, and I wanna try this theme also but in Naruto ninja version I am so excited for my nephews birthday! All the things are looking great. 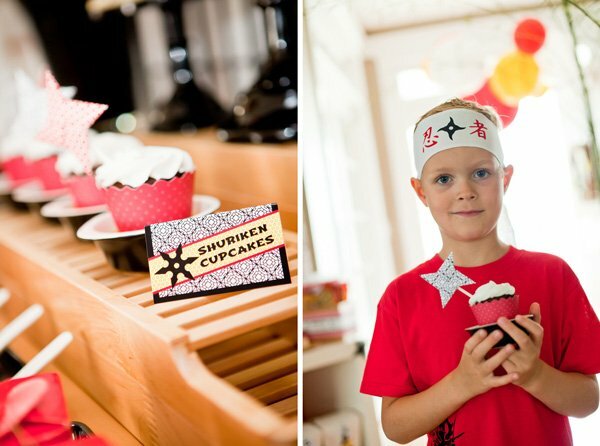 That Shuriken cupcakes are very great. Love this party! using the ideas for a power ranger party. What dud you use for around the sushi, the black candy? Hello, I was wondering what size lanterns you used for this party? I am trying to order some but there are so many sizes. Amazing!!! What did you use for the “nori” around the sushi?? Thank you!